Born in Naples, Italy on July 14, 1972, Salvatore was inspired by his father, who also was an Italian chef. 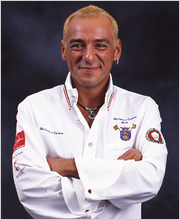 His career began at the young age of 11 as he trained himself to become a chef, traveling frequently between Italy and Japan. The harmonious combination of the two countries can be found within his cooking style, blending the traditional Italian art of cooking with the Japanese art of perfection. Now renowned to be the pioneer of Neapolitan pizza in Japan, he lives by the motto “to be the only one, not the number one”. Today I spent some time taking photos for our January/February brochure introducing Y's table's and the Kitchen's "Hokkaido Fair" promotion. Starting from February 2010 as part of the Hokkaido Fair promotion, the Kitchen will be serving a very special Taraba Crab ravioli. Still in the Christmas mood, we are already making preparations for our special February Hokkaido promotions!